We have been seeing a lot of cases that surround Licensing. Either regarding what is available, or how do I apply licenses. My goal for this blog post is to try and help clear up that confusion. NOTE: This information is valid as of this posting date. Please be sure to validate the pricing pages and individual feature capabilities as this can change over time, especially for cloud related services. Pricing may changes, new features may become available. If you have further questions regarding pricing, SA Agreements, or Premier contracts, I recommend you reaching out to a Sales Representative or your Account Manager if you have one. Option 1: Power BI Add-on for E3/E4 SubscribersE3/E4 is the Enterprise Subscription for Office 365. This includes Exchange, SharePoint and other features for O365. E4 includes Lync. O365 ProPlus Client is also available with E3/E4. Power BI is not. So, if customers want to use Power BI with a subscription they already have, they can purchase this option and it will provide the Power BI options to them. Option 2: Power BI StandaloneThis option includes the Power BI components along with SharePoint Online Plan 2. SharePoint Online is needed to use the Power BI Cloud pieces. 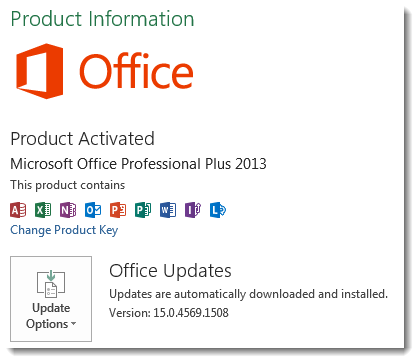 This does not include the other features of O365 such as Exchange, Lync or even O365 ProPlus Client. This is really just the consumption pieces of Power BI. They would need to have a separate license for Excel 2013 in order to create content. Option 3: Power BI Standalone + Office 365 ProPlusThis includes everything with the Standalone option, but also includes Office 365 ProPlus for download. 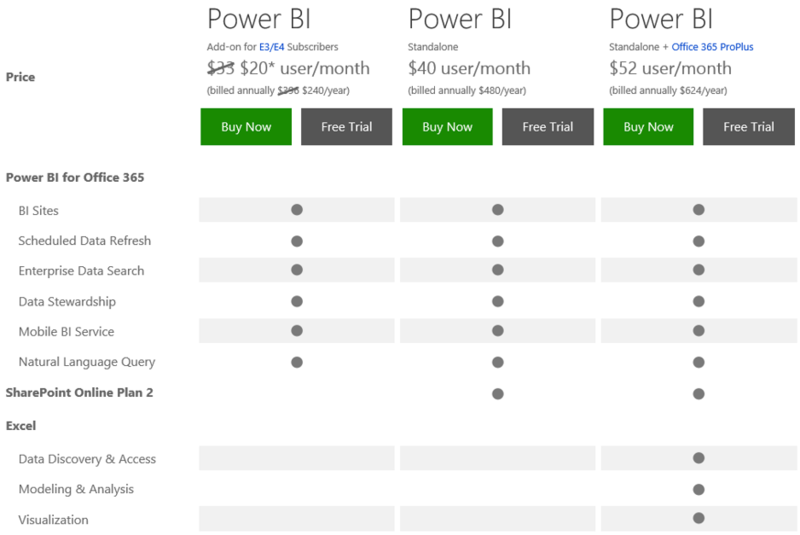 This is really the complete package for a customer if they don’t have any other O365 subscription and they want to use Power BI. By default, your Power BI license should be applied to the initial account that created the O365 Tenant, if you have a Power BI subscription. New users, created after the point of tenant creation, may not have the option assigned. You will want to verify what license has been applied to the given accounts. This is done through the O365 Admin Center under users and groups. The SharePoint Online (Plan2) option may show up under multiple subscription segments (i.e. 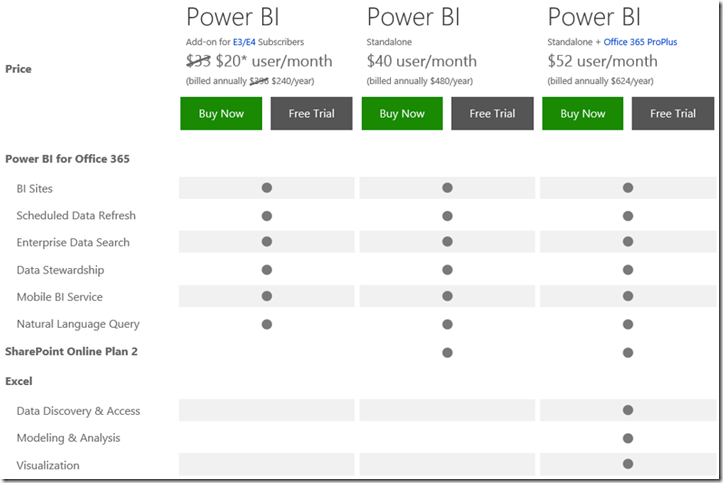 E3/E4 as well as Power BI). It only needs to be check in one of the segments. It cannot be selected in both. Check out a previous blog where I discussed some of the licensing and account settings with relation to the Power BI Admin Center. This will walk through the different client features that are part of Power BI for the Office 2013 Client. Excel 2013 StandaloneYou may not be familiar with this. This is the individual copy of Excel 2013 that you can buy. You can get this at any retail store (Walmart, Best Buy, etc…). This is the only version of Excel that a customer could go to a retail store and buy and would support some of the Power BI options. These are highlighted below. The history of Excel 2013 Standalone goes back to Power Pivot. Chris Webb (MVP) had talked about the problem toward the bottom of this blog post. At this point in time, the net result is that some of the Power BI Add-ins are available for Excel 2013 Standalone. BI for the masses! 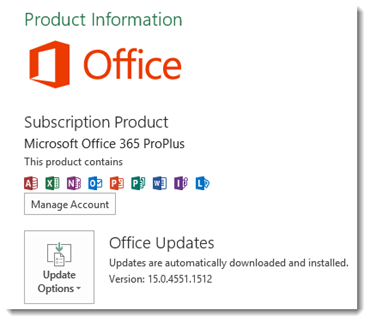 Power MapThis is available for Office 365 Subscribers only. 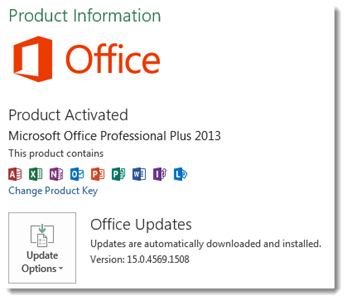 The Preview was also available for Office 2013 ProPlus and Excel 2013 standalone, but that will expire on May 30, 2014. This is the major outlier for the Power BI story when thinking about Excel 2013 Standalone, or non-O365 versions of the client. You can read more about the availability of Power Map here and here. Power BI Q&A ConsiderationsPower BI Q&A isn’t a client feature in itself, but there is an item that is available within the Office Client, specifically Power Pivot, that allows you to adjust the Data Model to effect the results of Power BI Q&A. This is the Synonyms item within the Advanced Tab of the Power Pivot manage experience. Synonyms were added specifically for the Linguistic Schema which Power BI Q&A uses. This button may be in a few different states for you or your customers. Either, present, disabled, or missing all together. This all comes down to the SKU of the office client that you have.